OMG Thank you for the wonderful response to the first round of the Eggface Things I Heart Giveaway. We had a ton of entries. Thank you so much for the lovely compliments about the blog I can't tell you how much they mean to me :) You all rock! Writing the blog everyday helps me keep my head in the game so I thank you for being out there reading. I wish I had a protein ice cream machine for everyone or you could all come over and taste how awesome it is for yourself. Congratulations!!! 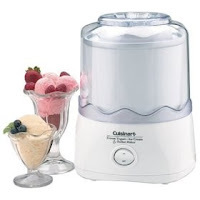 You are the winner of the Cuisinart 1-1/2-Quart Ice-20 Automatic Ice Cream Maker! Check your mail, follow email instructions and be sure to tell me whether you want a white or red machine. Come back every Sunday in the month of February (7th, 14th, 21st, 28th) to find out what that week's I Heart prize is. Tomorrow there's a GREAT one. Congradulations Lynn! Send your karma my way to be the next winner! Hi Shelley! These giveaways are great! I wanted to thank you for blog so much about your bento box lunch kit. Mine was waiting for me when I got home today, I can't wait to try it out. I have been out of work for a couple months and promised myself when I got a new job the bento box would be a gift to myself. And I think it will be a great post-WLS tool as well. congrats Lynn....what time should we be there for ice cream? You are going to love it. Because I found this blog and this lovely girl eggface, I've had mine (it's RED) since July. It's fabulous and the eggface protein Ice Cream recipes are the bomb. In fact, I've got a batch cookin' right now. I started it up and sat down at the computer to find this post and you as the winner. If you wrote a cookbook I would buy it! You should write a cookbook! I love.your blog and would love to get protein powder. Too expensive for me to buy right now. Thanks everyone - especially Eggy - due to me being a bit dumb I just found out I'd won!! Time to go fix that email address so that I see the emails daily! Hi Shelly, I am new here and am having my surgery 3/15. You have great insight and the giveaways are a wonderful way to "make friends" and help out with everyone. Thanks for the fun and information. Wish me luck.